The Skunk Ape, also known as the swamp cabbage man, swamp ape, stink ape, Florida Bigfoot, Louisiana Bigfoot, myakka ape, swampsquatch, and myakka skunk ape, is a hominid cryptid said to inhabit the U.S. states of Florida, North Carolina, and Arkansas. The Skunk Ape is named for its appearance and for the unpleasant odor that is said to accompany it. Eye witness descriptions of the creature describe the Skunk Ape as being relatively short in stature, with a reddish brown coat and dangling arms, a description not unlike that of the East African Agogwe or the Sumatran Orang-Pendek. Many reports also describe the Skunk Ape as having glowing red or green eyes; however this is normally attributed to the reflection of a flashlight or headlights when the creature is spotted at night. 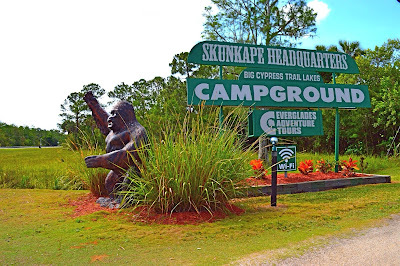 The earliest published reports of the Skunk Ape are from Suwannee County in 1942 by a man who claimed that one of the creatures hitched a ride on one of his running boards for a little over a half a mile. Since then the popularity of the Skunk Ape in southern Florida has continued to increase, along with the number of sightings. In 1957 two hunters claimed one of the creatures invaded their camp in Big Cypress National Preserve, and between 1963 and 1979 multiple reports came out of Hernando, Pasco and Collier Counties. 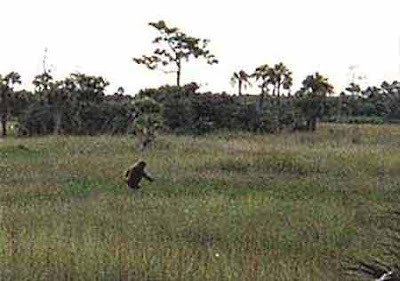 In 1997 foreign tourists traveling on a bus through the small town of Ochopee reported seeing the Skunk Ape and a naturalist working in the Everglades spotted what he described as a 7 foot primate. 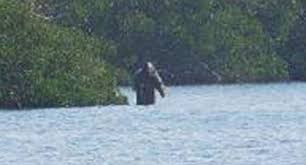 On October 13th, 1998, Naples daily news reported that Collier County campground owner Dave Shealy snapped 27 photos of a 7 foot tall creature walking through the Everglades. Shaely reportedly spend no less than 2 hours a night, every night, over an eight month period, parched up a tree in a homemade lookout in hopes of catching a glimpse of the creature. 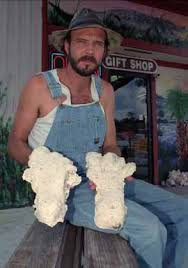 Shaely currently runs the only Skunk Ape Research Center in Florida. The same year the Dave Shaely took his photographs an Ochopee Fire Chief by the name of Vince Doerr also claimed to have taken a picture of the Skunk Ape in July. 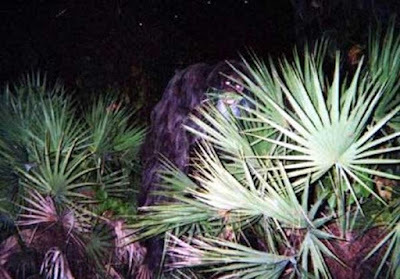 Perhaps the most famous photographs of the Skunk Ape were taken anonymously and mailed to the Sarasota Sheriff's Department, Florida, in the year 2000. These photos have become known as the Myakka Skunk-Ape photos. They were accompanied by a letter from a woman claiming to have photographed the creature just outside her backyard, she claimed that she was convinced it was an escaped orangutan. Many researchers believe that the Skunk Ape is nothing more a small population, or lone, wild orangutans that live the the remote areas of southern Florida and are the descendents of orangutans that escaped from the circus and international airports, or possibly from captivity as an exotic pet. 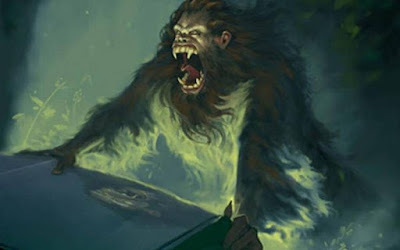 However reports of the creature being as tall as 7 feet would not support the orangutan theory, many believe that the Skunk Ape is a smaller cousin of the Sasquatch or Bigfoot and is an undiscovered species of primate. The discovery of the Skunk Ape, regardless if it is a previously known species or a new one, would serve to prove that there are still places on this earth animals can live virtually undetected by humans. There remains no physical evidence of the existence of the Skunk Ape, only eye witness reports and some very interesting photographic material let us know that something out of the ordinary lives in the Florida Everglades and surrounding areas. 1997 - tourists on a tour bus traveling through the small town of Ochopee claim to see a skunk ape near the side of the road. 1997 - a naturalist working in the swamps claims to see a 7 foot tall primate. I love stories like this, the mystery involved and the belief there are such creatures out there, that belief can be infectious. Bloke's Terrible Tomb Of Terror Needs Your Help!